thank you so much for your paticipation on the June Challenge so fare. 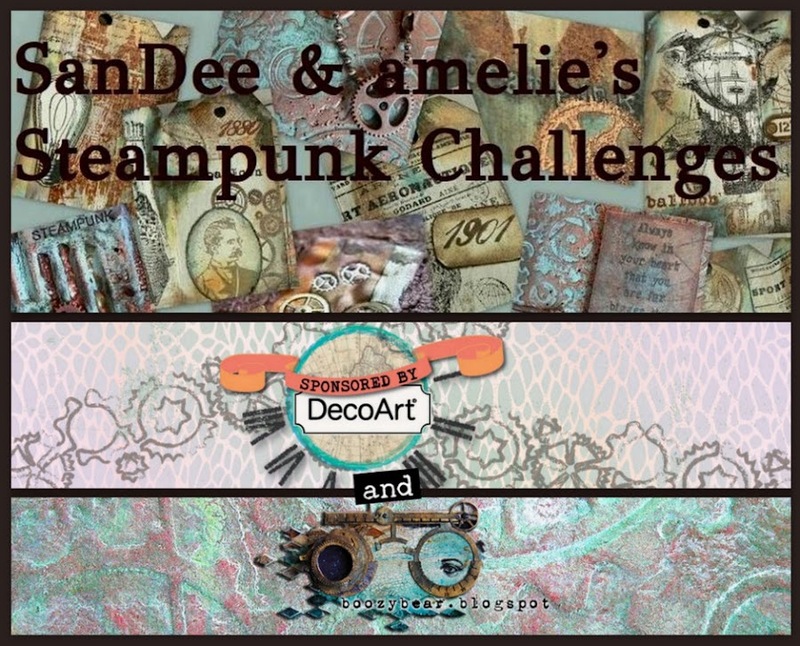 This STEAMPUNK CHALLENGE is still open till end of June but I really wanted to Spotlight one of your amazing Project even if it took a little bit longer this time. Voucher to the 3rd Eye store! Happy Crafting and hope to see more of your amazing Project. Hello, dear friends, readers and followers! 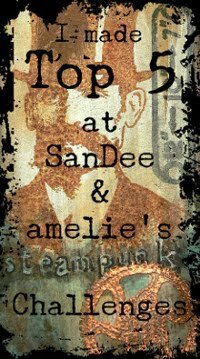 This is me, die amelie, back with the announcement of our Top3 and the randomly drawn winner of the awesome Redlead Stencils! Congrats, ladies! We really loved what we saw! And huge congrats to all the others who participated too! As usual it was really hard to make a choice! We so do hope that you will all play with us again and want to thank you for making this place such an awesome spot filled with loads of creativity and inspiration! 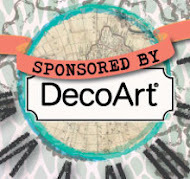 Now to our prize winner, who gets the three lovely stencils, given to me by Chris and Sharon from Redlead! A big THANK YOU once more to you both for supporting us with this great gift! Congrats, Mark, and have fun with your new stencils! 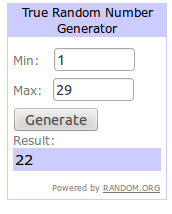 Please, contact me (by clicking the contact button in the side bar) for claiming your prize! 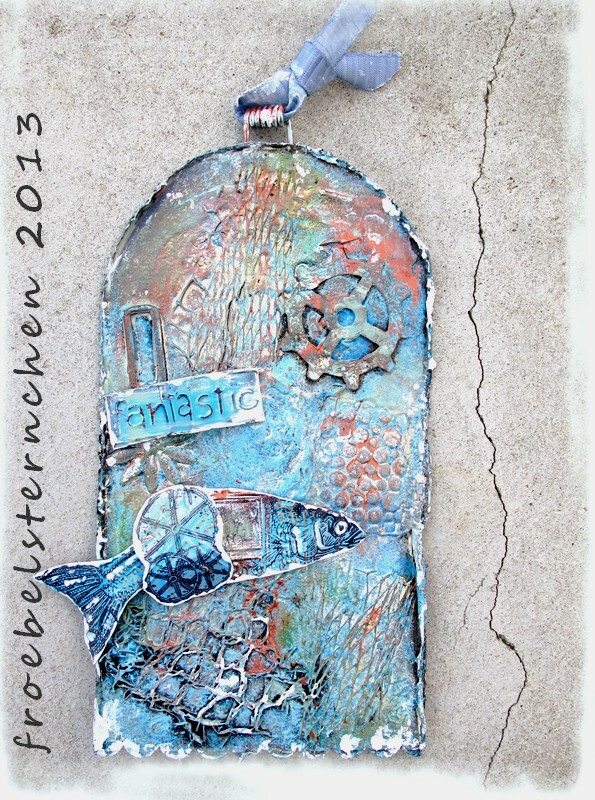 Our new challenge "Underwater Steampunk" has just started and this time we offer separate 2D AND 3D collections again. We hope you will join in and by doing so get the chance to win Drycha's voucher for shopping with her awesome 3rdEye stamp shop! Hello and welcome to our brand new challenge for this month! 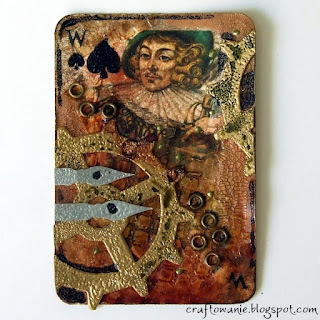 As usual there were awesome entries with our Altered Playing Cards challenge across the board, so choosing our Top3 will - as usual ;) - be a hard job, but we will announce them and the (randomly drawn) winner of the cool Redlead stencils soon! This time we will have a 2D and 3D section again, so feel free to create "anything goes" as long as it sticks to our theme and pay attention to enter your project with the correct collection (at the bottom of this erhemm erhemm quite word and picture heavy post). Our June Guest Designer is Drycha from 3rd Eye, who also provides us with the prize for this month's challenge winner! 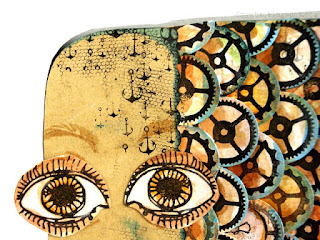 Drycha designs (and offers) a lot of awesome stamps with her store - most of them usable in very versatile ways and great for art journaling or any other mixed media art! You will learn more about her in a few secs. I'm Karolina Stopyra but You can know me also as Drycha. I'm owner and designer of 3rd Eye. Creativity is inventing. Recycling is creative. Making cable storage from toilet paper tubes is creative, stamping grass from hair of stamp with man was creative (die amelie did it;), making shovel from old detergent bootle is creative, meaking memo game from bootle caps... Well, creativity is squeezing more potential than originally planned from things, from occurrences, from everyday life. When did you start designing your own stamps (and why)? I don't want to tell that I have only super rare stamps - of course not. I have checkered board, arrows, flowers... ;) I wanna share something more practical too, for example stamp beams - You can create your own radial backgrounds without big expensive stamps! 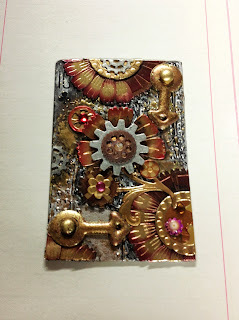 ...and You can stamp different background patterns, You can use "beam" as petal... Many different ways! Music and emotions. Clouds and light. Textures... just everything around. What makes you go for a new art journaling page? How does your working space have to be like to make your creativity flow? What are your favourite stamps (which qualities should they have)? Despite visions about amazing underwater ship of Captain Nemo in steampunk style or something like that I decided to create something more funny :a Fishy card with cogs scales. 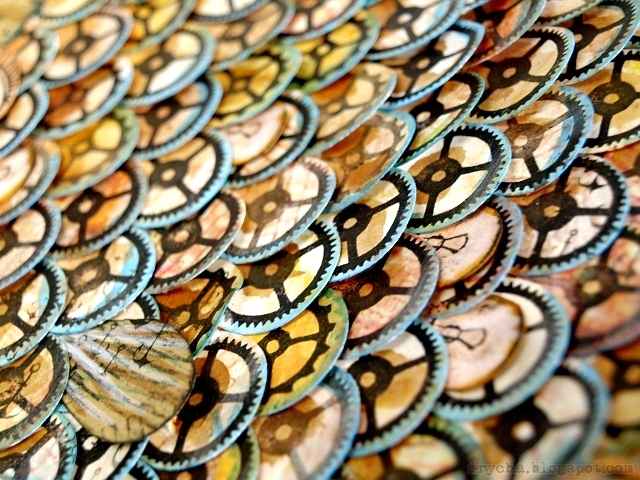 I stamped cogs on scrap paper and punch circles, then color edges of "scales"with Distress Stain and glued to base. I made some scales using lightbulb. Lips and eyes are stamps too. 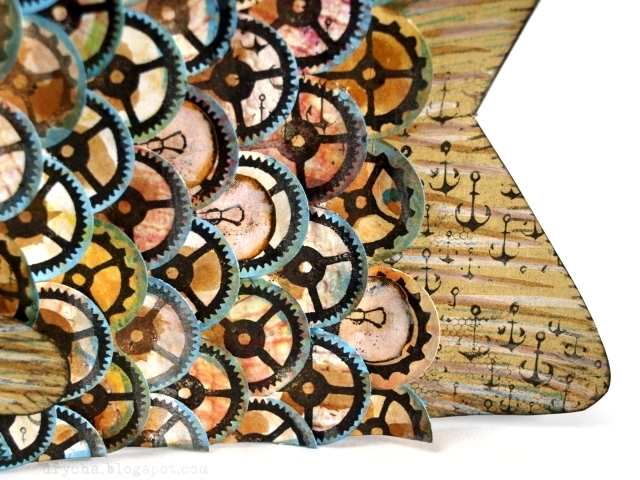 Aaaaand I used more stamps ;) Anchors background and tulle on the head and fins. Oh, and lines on fins. You can find here only paper, stamps, black pigment ink, few colors of Distress Stains and white Distress Marker. I want to thank so much SanDee and Die Amelie for inviting me here! So what's the prize for winner of that challenge? Drycha also offers a 10% discount code for the first three persons who place an order in her 3rd Eye store. Just write the code underwater on the basket, during placing your order. 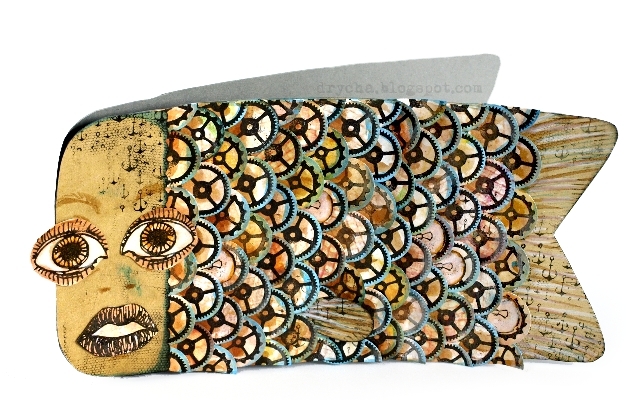 3rd Eye also has a reveal of new designs today! On the occasion of our "underwater" challenge Drycha created lovely seahorses (the same as on the voucher above). Check 3rd Eye blog to look at all new designs and for a chance to win some of them! Wow! Thank you so much, Drycha, for your lovely visit, for the fab fab fab underwater project and for being our generous sponsor this month! After this heavy load of inspiration and goodies on offer there's just one more thing to say to our dear readers old and new: we hope to see you soon with us, sharing your awesome and fun Underwater Steampunk projects!